Dale Steyn says he enjoyed the pace and bounce of the wicket at Perth Stadium, which suited the Proteas’ bowling attack perfectly. ‘Our strength, what I feel, is our bowling right now – it’s just hot,’ said Steyn. ‘When we looked at that wicket, it looked like there was gonna to be something in it. One of our strengths has been our bowling for a while now. ‘Go in there and see if you can do well and potentially bowl them out cheaply and then try and chase it down with the bat and bat well. It all went to plan today. It all worked out nicely for us,’ said Steyn. ‘This wicket had something in it, and I think our bowlers were relentless with their lines and their lengths and just made it extremely difficult to score. 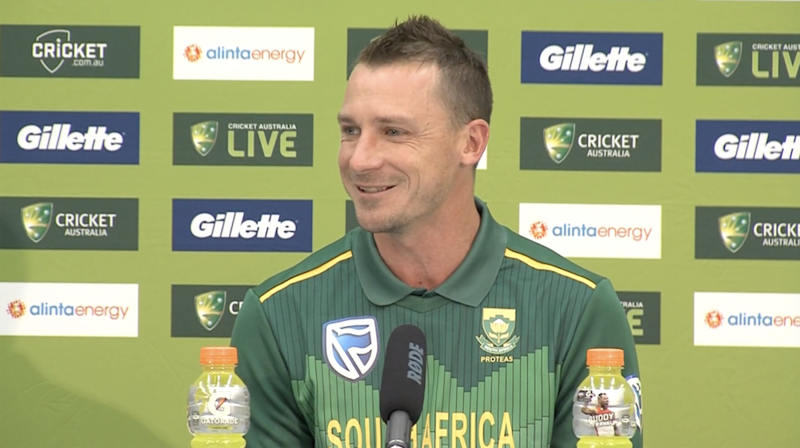 Australia had to kind of take a risk and play good shots off good balls rather than good shots off bad balls, and when you’re bowling good balls all the time, you’re questioning and you’re pushing, putting guys under pressure and their technique and their ability to score, so I thought we bowled really well,’ added Steyn.